Recently, I was sitting on a French beach. The sunshine was warm on my back and bathing suit-clad locals and tourists splashed happily in the surf in front of me. A gentle sea breeze blew over the water, as couples strolled the promenade behind me with their small dogs and young children. It felt just like the middle of summer. The funny thing? It was actually November. 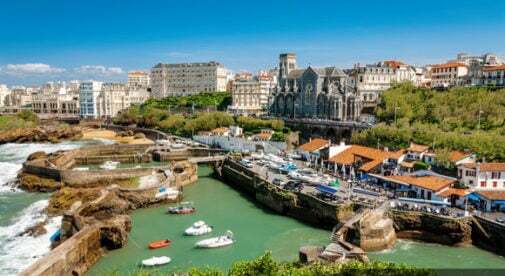 In fact, that day, Biarritz—the French beach town where I was staying—was officially the warmest city in Europe. It beat even southern Spain and always-temperate Malta to claim the title. And everyone was celebrating the early winter sunshine with a dip in the Bay of Biscay. Before I spent time in Biarritz, I didn’t think of France as a particularly temperate climate. I’ve been to Paris in the winter twice—and it’s definitely scarf-and-hat weather up there. And when I told friends I was going to Biarritz to escape the snows of Switzerland (where I currently hang my hat) for a little while, they told me I should pick Spain instead of France. France, they said, would be chilly this time of year, even in the south. What I (and they) didn’t know is that this little stretch of coastline is actually moderate year-round, with the coldest winter average (in January) falling in the mid-40s and the height of summer falling into the high-60s or low-70s. In other words, there’s a reason the surfers are still chasing waves in the winter and the locals are still taking their daily strolls along the sand. Of course, the warmth wasn’t the only surprising thing about my month in Biarritz. If you don’t count transportation to and from France, my budget came in at around $1,700 for the whole month—and that’s with an apartment two blocks from the beach and daily visits to the many cute little crêperies and bakeries scattered around town. Who knew that French coastal life (and in a town known for its long-time attraction of the European glitterati) could be so affordable? 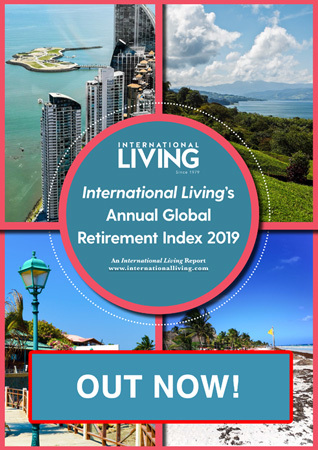 For me, this is the little-known secret of Europe: Its old-world charm, glamorous beach towns, excellent health care, and world-renowned food can also come with temperate weather and a reasonable cost of living, if you know where to look. And so my November was spent walking along beaches and through pretty green parks, eating French crepes, sipping good Italian coffee in a beachfront café, and exploring nearby towns like the extremely photogenic Saint-Jean-de-Luz (which is known for its peppers and its status as a Rick Steves favorite) and Bayonne (the oldest chocolate-producing city in France, where you can still find a cup of authentic, hand-whipped hot chocolate). Near the end of my trip, a friend wrote to ask me how the weather was and if I would recommend this coast as a place to live. For all the reasons above and more, I gave her a resounding yes.